Listen up fellas: Valentine's Day is just around the corner, and if you're in need of some gift inspiration for your lady loves (wink wink), here are 10 suggestions to help keep you out of the doghouse. Or, if like me, you enjoy treating yourself to a thing or two this time of year that's sickeningly cute (those shoes! ), this here's for you too, ladies... From heart shaped clutches (swoon!) 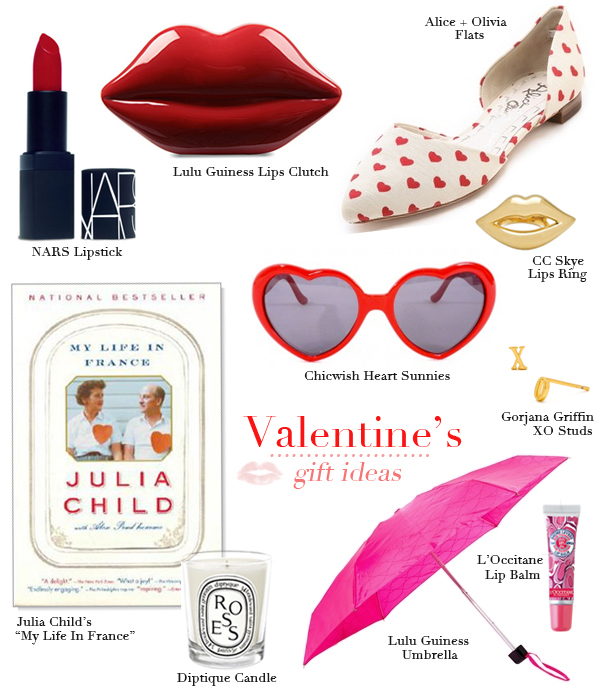 to lip-emblazoned everything (my CC Skye ring is still in heavy rotation), there's no shortage of heart day treats to chose from... Let the shopping begin! Ooh can you imagine opening the Lulu Guiness bag..!! What a dream! Hmm I never would of thought of getting an umbrella for her! I feel like if you incorporate some of these with some homemade creativity, you'll have the perfect gift for Valentine's day!